One of the more unusual features discovered during the excavations was a large water-logged pit dating to the Roman period, located at the southern edge of the site away from the main temple and shrine buildings and close to the River Ock. In 2006 a complete Roman pot and a worn Roman shoe was found in the pit, the organic material having been perfectly preserved by the anaerobic conditions in the pit which is below the water-table. The pot is a late Roman type and has a large hole in one side, pierced by some form of sharp point, possibly a spear, as a deliberate act in which the pot was ritually stabbed or ‘killed’. 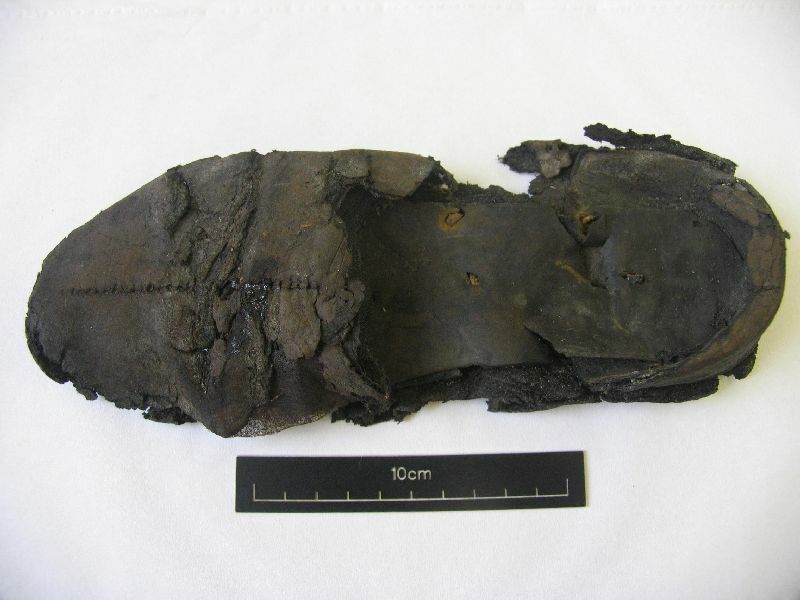 The shoe is very worn but largely complete, apart from the upper section. The sole is studded with a small number of hobnails, a modest amount compared to the heavily-nailed military strapped ‘caligae’ type worn by Roman soldiers. The Marcham shoe has a substantial ‘upper’, stitched down the middle. It may have been a ‘calceus’ type, which largely covered the foot or possibly a ‘soccus’, which is a low shoe or slipper. In the Roman period ‘soccus’ were worn by both sexes as a house shoe or slipper. Unfortunately the upper edges of the shoe are so damaged it is uncertain which type it is. The size of the shoe (250mm long and 90mm wide at widest point) would make it a 5 to 6 in modern shoe sizes, so it could have belonged either to a small footed man or more likely a woman. Although in the Roman period people were generally smaller than our modern population, collections of shoes from Roman urban sites such as Billingsgate in London show a size range from about 155mm in length (child size 5) to about 285mm in length (adult size 12), which indicates that our shoe, equivalent to a modern size 5-6, does not equate with a particularly large adult shoe size in the Roman period. 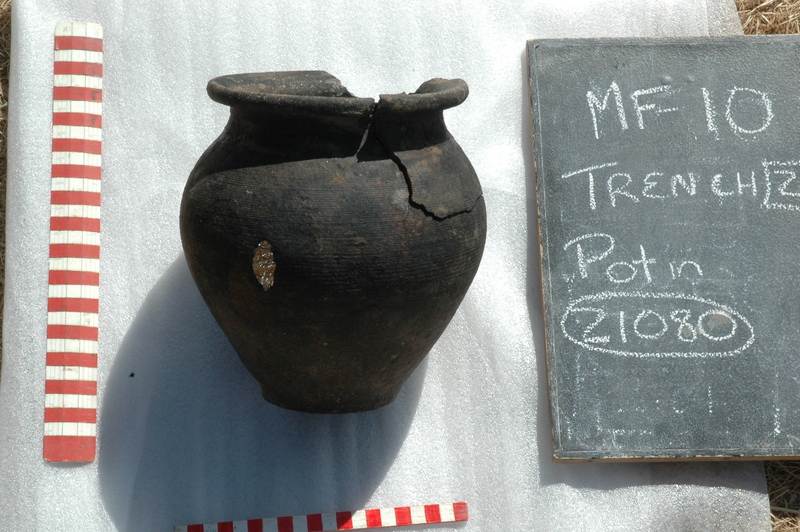 In 2010, excavations in the same pit revealed another complete Roman pot, further fragments of leather, and perforated sections of wood, a cow skull, and spectacularly a wooden writing tablet and an almost complete Roman basket. 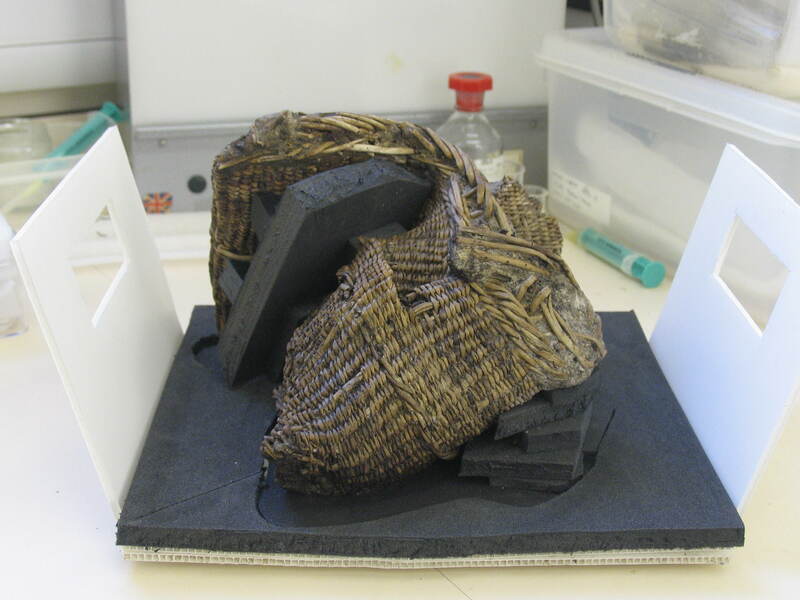 The basket was in a very fragile condition when found, and had to be dug and lifted up in a block of soil, then transported in a water-filled container to the York Archaeological Trust Conservation Laboratory, where the mud was painstakingly extracted from it, before it was conserved. The conservation involved immersing the basket in a varying PEG wax solution for several months to consolidate the organic fibres. 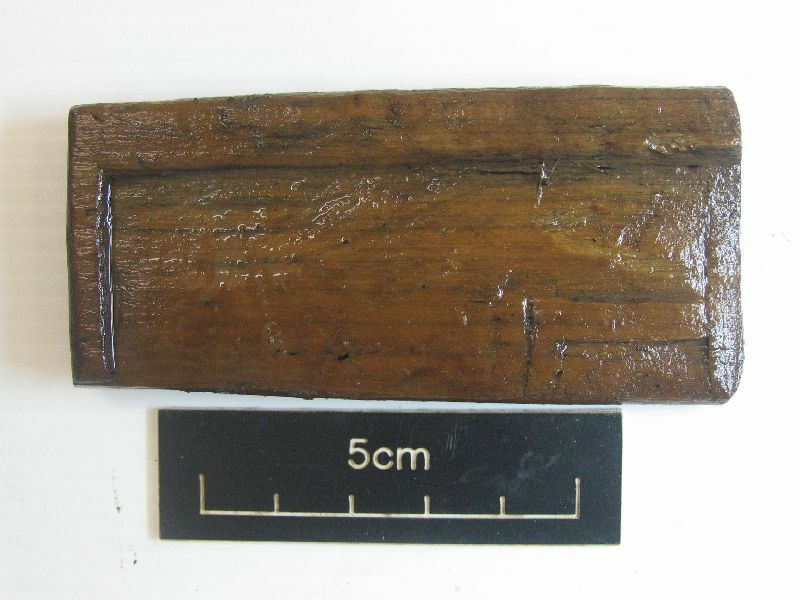 The wooden writing tablet is a rare find outside of Roman military sites and large urban waterlogged sites. It is the type that would have been filled with melted wax, in which short messages or instructions were engraved on it by means of a stylus. It was probably cut-down from a slightly larger tablet and then re-shaped and finished for use, reducing it to a ‘post-it note’ size as opposed to the original ‘post-card’ size. The Marcham tablet is a single tablet of modest proportions, recessed on one side only, and very different from the larger tablet types generally used for legal or business documents. Its small size suggests it might have been used for lists or short messages. Perhaps it was inscribed with a short message to the gods of this site before being deposited in the watery pit? Any writing has long since gone with the wax, which doesn’t survive, but some tablets can hold faint traces where the original text inscription has gone through the wax. In order to check for this, an RTI (Reflectance Transformation Imaging) image of the tablet was taken with a piece of ground-breaking technology currently being tested at the Centre for the Study of Ancient Documents by Dr. Kathryn Piquette. This system takes multiple images of an object under an imaging dome studded with 76 LED lights. An image can then be manipulated on a computer and lit virtually from many directions in order to pick out the finest of details. Some faint linear cuts, which may be traces of a few letters of Roman script, are visible on our tablet on the first RTI scan. Further analysis of these images will be done to determine whether any meaningful script can be made out. The Roman basket is another mystery – what was it used for during the life of the Roman temple and its inhabitants and visitors, and why was it deposited in this pit alongside the other objects. Did it contain anything like foodstuffs that would not have survived even in waterlogged conditions? A large part of the basket survives, except for its base, and associated with it were thicker fragments of young oak, which might represent a handle, and small narrow strap-like pieces, some perforated, which may represent fastening straps for a lid of some kind. Felicity Wood and others from the Basketmakers’ Association have studied the basket and there are plans to apply for funding from the Worshipful Company of Basketmakers, so a complete replica can be made. Establishing the original shape of the vessel is difficult due to the base being removed and the whole structure warping through time. However it seems most probable that it was originally round and drum-shaped, possibly with a fastening lid and carrying handle. Dr. Stephen Harris, a plant species expert from Oxford University Plant Sciences Department has established that the uprights or ‘stakes’ are made from stripped willow, and even the very fine horizontal ‘weavers’ between them are also made from willow. Today it is impossible to find willow as fine as this for basket-making, but it is known from contemporary Roman sources such as Pliny, that in the Roman period very fine willow, much finer than most willow found in Britain today, was available and deliberately cultivated. In tribal cultures across the world baskets could have a ritual and religious function as well as a practical one. For example the Ute Indians in Arizona used highly decorated baskets to cover their dead and many of those baskets were deliberately pushed inward at the base, so as to end the life of the basket and enabling it to accompany the deceased into the spirit world. In ancient cultures in Europe and the near East, contemporary writers refer to baskets being used in religious ceremonies as sacred vessels to carry both votive offerings and objects used in the holy rites. Both Greek and Roman texts refer to basket-bearing maidens and priestesses performing key roles in sacred ceremonies. Baskets were used particularly in the worship of Demeter and Dionysus and in initiating people into the Eleusis Mysteries. The sacred basket of Demeter can be seen on various Greek coins. We can only speculate as to whether the Marcham basket originally had some key role in sacred ceremonies on the temple site, before being ‘killed’ and deposited in the pit. 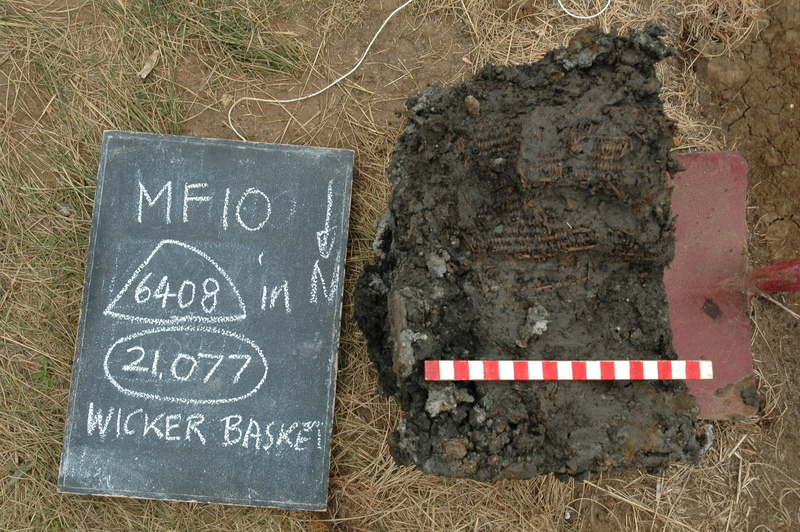 The water-logged pit is dated by the pottery types to the late Roman period, and the limited and unusual nature of the objects found in it strongly suggest that the selection of objects represents some kind of ritual offering, having been ‘ritually killed’, a phenomenon seen on many prehistoric and Roman sites, or in the case of the shoe, to have been so worn as to have become non-functional. There are other instances of interesting ritual activities at the Marcham temple site in the late Roman period, at what was effectively the end of its life, including a small group of inhumation burials laid across the eastern entrance to the arena, and a large deposit of late Roman coins found in a narrow shaft surrounded by a small walled structure in Trench 36. Does all this behaviour perhaps represent the last gasp of paganism by local devotees in the face of the official imperial edict that Christianity should replace the former worship of pagan gods? Or perhaps the offerings in the water-logged pit and the coin-rich shaft were carried out by Romano-British Christians, who were ceremonially ending the life of the pagan shrines on the site in order to move on to the new worship of the Christian God. 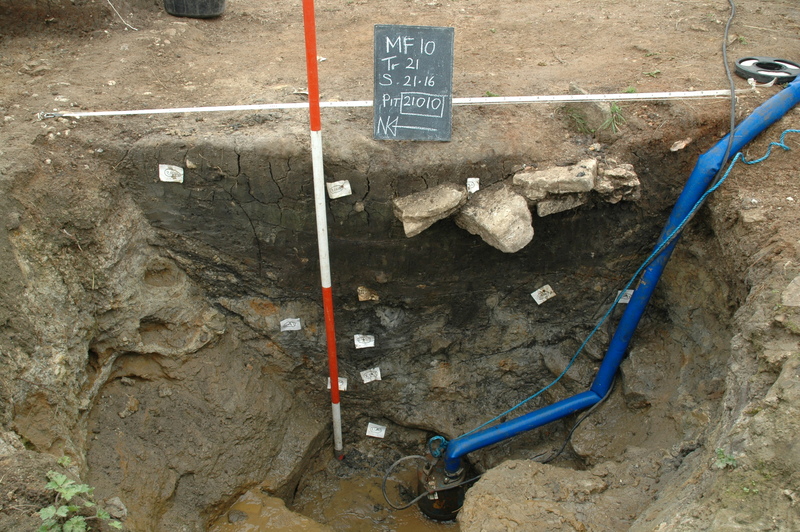 As with many of the features on this fascinating site, the discoveries in this pit have shed light on the rituals of our distant past and given us a glimpse of our ancestor’s relationship with their gods – whether carried out in stone-built shrines or in the watery gateways to the underworld in pools, pits and rivers. We would like to thank Gill and Melville Cox of Butler Cox Flooring Ltd, in Abingdon for generously funding the full costs of the conservation of the three objects at the York Archaeological Trust’s Conservation Laboratory.